When I was in my early teens, I really liked this verse a lot, without really understanding what it really means. To a 13 year old me, it sounded cool and majestic, it sounded like the perfect answer to all my identity problems. But it is so much more than that. I can say ‘I am who I am’ in defiance to those who question my identity and sound cool; but when God says that, it is an entirely different dimension altogether. That is the dimension we’re diving into today, the realm of God‘s almightiness; His omnipotence; His omnipresence; His omnibenevolence. Exodus is the second of the 5 books of Moses, and continues on the history of the Israelites as ended in Genesis. In Exodus, Moses is the ‘main character’, and through this man of God we see how God delivers his people, tolerates his people, punishes his people, but most importantly, we see his faithfulness to his promises. 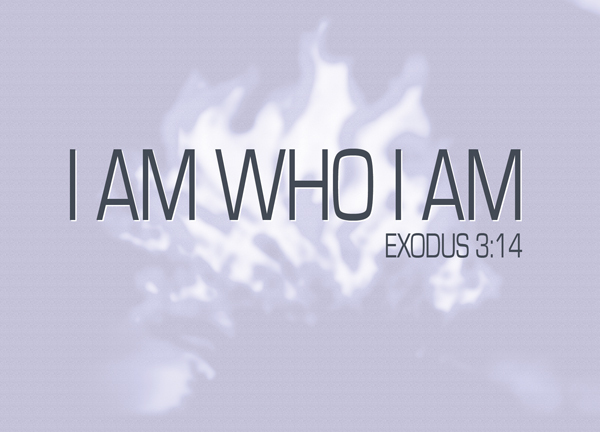 In the first few chapters of Exodus we are introduced to Moses as the pivotal character to God‘s deliverance of his people, and in his hesitation God assures Moses, ‘I AM WHO I AM’. If the Israelites ask who sent you, tell them, I AM has sent you to them. If it was a mortal saying that, it would have come off as cocky. But because it was God who proclaimed it, and because it is a proclamation that was and still is true, it becomes amazing. God has many names as listed in the Bible, but I AM WHO I AM is one of the first instances of God explaining his majesty through His own name. Names represent our hopes and wishes of someone’s character – when we name, we hope. But when God names, there is power, and things happen. The name of the LORD is a strong tower; the righteous run to it and are safe [Proverbs 18:10]. In trying to understanding I AM WHO I AM, we must first understand one of the most common personal names of God, יהוה‎, or YHWH (Yahweh); which in the Bible appears as the LORD (in small caps), whereas the uncapped Lord means lord, adonai, not a personal name. It was thus written because the Jews held this name in such high regard that they would never utter it out. In Exodus 3:13-15 we see three instances of how God refers to himself. YHWH and I AM are both derived from the same word in Hebrew, and in Exodus 3:13-15 God uses both YHWH and I AM interchangeably. This is the first clear instance in the Bible where the Lord’s name is discussed to such extent, and we will explore the implications of it. God exists, and He has come to deliver His people. Before you believe in the other attributes of His name, you must first accept that God exists. Just like how Genesis 1:1 [Article] calls for you to understand and believe that God exists, if you do not believe in God‘s existence, the other attributes that this name of God brings out will bear no meaning to you. Imagine when Moses tells the Israelites, God, I AM, YHWH, has sent me to you. If the Israelites refuse to believe that God exists, everything else makes no difference to them. God exists, and because He exists, the other attributes in I AM WHO I AM become important to us. His personality and power are owing solely to himself. God has no beginning. He is the beginning. He sends Moses, but nobody is behind God. Nobody created God. Nobody told God to send Moses. Nobody influenced the Lord to do anything. Nobody can influence the Lord. He is the reason, and He himself is accountable to His own actions, and nobody else. He doesn’t need to account to anybody else. He doesn’t need to explain anything to anyone. The end of all our questions terminate in God. We can’t ask, God, who brought you into existence, because there’s no such thing. I AM WHO I AM, he declares, and it is that straightforward. There is nothing else behind Him. The Lord (YHWH), the God of your fathers – the God of Abraham, the God of Isaac and the God of Jacob – has sent me to you [Exodus 3:15]. Just as He was God of Abraham and He watched over Abraham, He would be God of the Israelites and watch over them. Just as He was God to Isaac and watched over Isaac, He would be God to the Israelites and watch over them. Just as He was God of Jacob and watched over Jacob, He would be God to the Israelites. He was the same God to their fathers as He would be to them. He is constant. He is unchanging. As He himself declared, I the Lord do not change [Malachi 3:6]. In this we gain great hope, because God‘s attributes and characteristics do not change, we are thus assured in His promises. I AM WHO I AM, says the Lord; He never changed from the past to the present, and is everlasting – He won’t change from present to future either. God is omnipotent, omnipresent and omnibenevolent. He is all encompassing, and he tires not. God does not grow weary. He cannot grow weary – there’s no such thing as He can only watch over you in the day, and at night you’re all alone. There’s no such thing as He can only watch over your brother, but He has no time for you. No, God is not limited to the limitations that binds us as humans. He is everywhere, He can do everything (that does not betray His own characteristics), and He encompasses of everything. There is no limit to His might. We don’t need to fear that anything is too difficult for Him. Rescuing the Israelites from slavery under the Egyptians was akin to Mission Impossible. But in God, it was possible. I AM WHO I AM – God is the source of energy. God is simply who He is, and not who we want Him to be. Our faith in God is not one of convenience, where we ask Him of things and He grants them to us. It is a faith of convenant, a convenant between Him to us and us to Him. We must conform to His greatness, and not expect Him to do things our way. Often, His delivers us in His unexpected godly fashion. He delivered the Israelites in godly fashion – the 10 Plagues. Maybe the Israelites expected the Egyptians to be overthrown, or to die, so that they would be freed. But God does things His own way. If the Egyptians are behind us, and the sea before us, we grumble. But God does things in His own majestic way. He splits the Red Sea. Imagine if the parents conformed to the child. Imagine if the teachers conformed to the students. There would be no learning, there would be disaster. The parents know what is good for the child. The teachers understand the students better than they understand themselves. That is God. We must conform to Him, and not to anything else in the world. Of course, He has no need to conform to us. He is an objective God. Let’s not use our subjectivity to measure His greatness, because we can’t. “I tell you the truth,”Jesus answered, “before Abraham was born, I am!” [John 8:58] – Jesus used the name I AM to express His identity as the Son of Man, and that He was with God in the beginning [John 1:2]. The way he used was largely in the same way God used it in the book of Exodus, and in that proclamation affirms that He is the Messiah, sent by God to redeem our sins on the cross. In Christ, God has drawn Himself near to us. Through Christ, we can see the glory of God without fear. This list isn’t exhaustive. If one continues to study it, there will be more things that you can get from I AM WHO I AM. In knowing and understanding God‘s names, we understand the attributes of our Lord better, and we understand His promises better. Those who know your name will trust in you, for you, LORD, have never forsaken those who seek you [Psalm 9:10]. It is a promise. His name is powerful. Anybody can declare I am who I am. But that merely signifies his confidence in himself and expresses a defiance to society. When God declares, I AM WHO I AM, it is a promise, and things will happen. That said, God has several other names. In understanding all of them, we will understand our God better. In the AV (KJV) YHWH is rendered LORD (all uppercase to distinguish God from other lords). In French Bibles, YHWH is rendered L’Éternel (The Eternal). For example: L’Éternel est mon berger = The Eternal is my shepherd. I love this, it seems the perfect rendering of the name of the great I AM. good stuff, especially point 5. By the way my son has just flown into Singapore, he helps lead a mission team. Ah? Usually mission teams go to other parts of Southeast Asia. Will keep him in prayer, though.